This weeks case involves a 21 year old cat, Caruso Koby, that was presented to us because the owner was unhappy with the progress of it's care at another veterinarian. The cat had an ear infection that was not healing well. Several antibiotic had been used an a poor response had been seen to treatment. The cat had been anesthetized and the ears had been cleaned in an attempt to created a better environment for treatment. I believe a culture had been done to identify the causative agent and a yeast was identified. On our initial exam the ear was quite sore and full of purulent debris. We cleaned out the ear with fluid ear washes but were still unable to view the ear drum and Caruso was starting to become unhappy. We filled the ear with a drying agent, took Caruso off of antibiotics and scheduled a recheck. When we rechecked the ear 3 days later it was much less irritated but we were still unable to view the tympanum and we encountered some bleeding in the process of trying to clean the ear canal. Since we had taken Caruso off of antibiotics we did a bacterial culture which revealed two unusual bacteria in moderate numbers. However, the bacteria were not unusual in their patterns of susceptibility though they were resistant to the antibiotic that she had been on when presented to us. We place Caruso on an oral antibiotic and a topical antibiotic that the identified organisms were susceptible to. When Caruso was examined one week later the ear was not painful and was better but still had some drainage. We attempted to examine the ear canal again but again encountered bleeding on exam. We were trying to avoid anesthetizing this older cat again but were unable to be gentle enough not to cause bleeding even though we were using only gentle fluid lavage to clean the ear. We elected to continue antibiotics for a few more days. Two days later the owner called and said that Caruso was developing a head tilt towards the side of the of the affected ear. We admitted Caruso the next day to work up the case. As can be seen on the radiographs an erosion of the tympanic bulla (bone surrounding the inner ear) was present. While infection could have done this usually infection will result in a more proliferative (bone producing) lesion on radiographs. 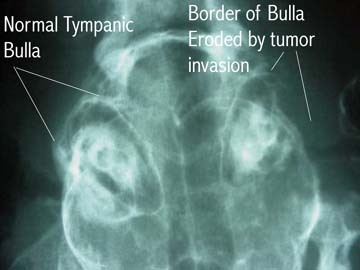 A likely diagnosis of an aggressive tumor was given to the owners. The owners had had previous bad experience with a cat that had cancer and were not anxious to pursue aggressive cancer therapy without confidence that a cure could be accomplished. This was not likely in this location. There are many important nerves and vessels that run through this region. It was also the impression of the owners that the quality of life was rapidly declining on this previously healthy older cat. The owners elected to euthanize Caruso to avoid a progression of a probably fatal condition. While the owners did not wish Caruso to undergo a complete necropsy (autopsy) they did agree to allow a needle biopsy of the suspected tumor. 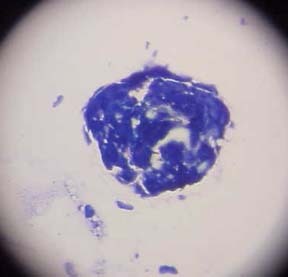 The results of the biopsy are seen here with the cells present showing the characteristics of cancer cells of an epithelial origin. 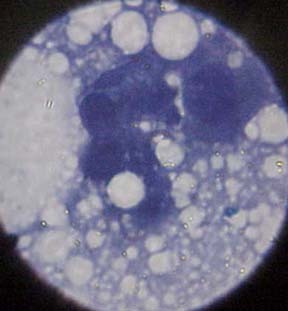 The cell nuclei vary widely in size which does not happen in normal epithelial tissue. In this lower power view a cluster of cells is present that is often seen in the cells that form normal skin. However, in this case the cells came from the core of tissue taken from within the tumor mass. A presumptive diagnosis of squamous cell carcinoma is likely. While this case of the week does not have a happy ending it does illustrate an interesting series of events that can be a frustration to veterinarians when we encounter a seemingly minor problem that is brought on by more serious underlying condition. It could be argued that we, and the other veterinarian should have radiographed the ears earlier. That is easy to say in retrospect but it is also true that we try to avoid doing unnessary procedures because of the expense involved. We each try to balance the potential benefit of a procedure against the cost. We are sometimes wrong. We are all hopefully doing our best to consider the needs of both our patients and our clients. It is also likely that radiographs taken earlier would have been much harder to interpret. Caruso was a very nice cat and the owners will miss him. In this case I'm not sure that they didn't do Caruso a favor by not doing aggressive therapy to diagnose and treat this tumor. Radiation therapy would have required hospitalization at a teaching institution. We will miss Caruso also.